The maternally inherited bacterium Wolbachia often acts as a subtle parasite that manipulates insect reproduction, resulting potentially in reproductive isolation between host populations. Whilst distinct Wolbachia strains are documented in a group of evolutionarily closely related mosquitoes known as the Culex pipiens complex, their impact on mosquito population genetics remains unclear. To this aim, we developed a PCR-RFLP test that discriminates the five known Wolbachia groups found in this host complex. We further examined the Wolbachia genetic diversity, the variability in the coinherited host mitochondria and their partitioning among members of the Cx. pipiens complex, in order to assess the impact of Wolbachia on host population structure. There was a strong association between Wolbachia and mitochondrial haplotypes indicating a stable co-transmission in mosquito populations. Despite evidence that members of the Cx. pipiens complex are genetically distinct on the basis of nuclear DNA, the association of Wolbachia and mtDNA with members of the Cx. pipiens complex were limited. The Wolbachia wPip-I group, by far the most common, was associated with divergent Cx. pipiens members, including Cx. quinquefasciatus, Cx. pipiens pipiens form pipiens and Cx. pipiens pipiens form molestus. Four other wPip groups were also found in mosquito populations and all were shared between diverse Cx. pipiens members. This data overall supports the hypothesis that wPip infections, and their allied mitochondria, are associated with regular transfers between Cx. pipiens members rather than specific host associations. Overall, this is suggestive of a recent and likely ongoing cytoplasmic introgression through hybridization events across the Cx. pipiens complex. Symbiotic associations with the intracellular bacterium Wolbachia are extremely widespread in insects [1–3]. Wolbachia is typically maternally inherited through the egg cytoplasm and has evolved a variety of interactions with its hosts, exerting subtle effects such as manipulation of host reproduction or protection against natural enemies [4–6]. Each of these effects is advantageous to infected females and thus enables Wolbachia to spread rapidly through insect populations. These effects are also of ecological and evolutionary importance to the particular host species that is infected, potentially inducing reproductive isolation or driving changes in sexuality [4–6]. Mosquitoes of the Culex pipiens complex have long been recognized to exhibit a great variability of effects associated with Wolbachia. In this host, Wolbachia, known as wPip, is associated with cytoplasmic incompatibility (CI), a sperm-egg incompatibility between infected males and uninfected females, so that infected females have a reproductive advantage [7–9]. Apart from this simple case, CI has been also observed in a number of cases between males and females carrying incompatible wPip strains [9–12]. Five housekeeping genes developed for Wolbachia multilocus strain typing (MLST)  and the Wolbachia surface protein gene wsp present no variation among these wPip strains, showing that they delineate a recent and monophyletic clade into the B Wolbachia supergroup . The recent examination of fast evolving markers, such as the ank2 and pk1 genes encoding proteins with ankyrin (ANK) motifs, revealed the existence of more than 100 genetically distinct wPip strains [9, 11, 14], belonging to five distinct subclades and further referred as wPip-I to wPip-V groups . Since their molecular characterization, several recent studies have further showed that some wPip strains are mutually incompatible but also that some others, although genetically distinct, are fully compatible [9, 11, 14]. Meanwhile, wPip has also emerged as a conditional mutualist that protects Cx. pipiens against mortality induced by the avian malaria parasite Plasmodium relictum. Overall, these studies revealed that wPip is an important associate of most mosquitoes in the Cx. pipiens complex potentially driving its evolution. How wPip infections interact with the genetic structure within the Cx. pipiens complex remains still unclear. Mosquitoes in this complex have a global distribution in all temperate and tropical regions, with a recent history of association with human migration [16, 17]. The complex encompasses a group of genetically closely related taxa with distinct behavioural and physiological traits that greatly influence their distribution. The most obvious variable traits include larval habitat preference, vertebrate feeding pattern, mating behaviour, gonotrophic development and ability to enter into diapause during the winter . Despite these differences, members of the Cx. pipiens complex have controversial taxonomic statuses (including subspecies, forms or biotypes delineations) and, even though they are genetically distinct, they remain difficult to separate morphologically. Four species, or subspecies according to the authors, are frequently recognized as members of the complex: Cx. pipiens, Cx. quinquefasciatus, Cx. australicus, and Cx. globocoxitus, as well as two subspecies: Cx. pipiens pipiens in Europe and North and South Africa, and Cx. p. pallens, in Asia. In addition, two sympatric forms, pipiens and molestus, are also encountered in Cx. p. pipiens in the Northern hemisphere. Cx. quinquefasciatus, commonly known as the southern house mosquito, exists all across the tropics and the lower latitudes of temperate regions. Cx. australicus and Cx. globocoxitus are restricted to Australia and are poorly known. Although the exact taxonomic status of the Cx. pipiens members remains controversial, their close evolutionary association has been repeatedly supported by genetic analyses and the relative abundance of hybrids in areas where distributions overlap [18–22]. Remarkably, whilst wPip was never detected in Cx. australicus and Cx. globocoxitus, infection frequency was near or at fixation in almost all populations of both Cx. pipiens and Cx. quinquefasciatus[8, 23–25]. When first described, any of the five wPip groups were found associated within given infected members of the Cx. pipiens complex . However, only a limited number of Cx. pipiens and Cx. quinquefasciatus laboratory lines have been examined, making this result difficult to interpret. This issue is of special importance since Wolbachia may either produce reproductive isolation between host populations infected with different Wolbachia strains, or reinforce an existing divergence by selecting for pre-mating isolation mechanisms [4, 5]. The presence of closely related host taxa within the Cx. pipiens complex is thus a relevant system to test such a hypothesis. Here we have approached this issue by undertaking an extensive screening for the presence, the diversity and the partitioning of wPip infections in natural populations of the four main members of the Cx. pipiens complex (Cx. quinquefasciatus, Cx. p. pipiens form pipiens, Cx. p. pipiens form molestus and Cx. p. pallens), spanning 118 natural populations and 64 laboratory lines. With this aim, we characterized each wPip individual infection using two to five Wolbachia markers and identified Cx. pipiens members using diagnostic nuclear markers, including microsatellites for a subsample of populations. Since Wolbachia and host mitochondria are co-transmitted in egg cytoplasm and therefore are in linkage disequilibrium, we also examined the mitochondrial (mtDNA) diversity through the sequencing of one to three mtDNA markers. Using this approach, we thus attempted to infer the contribution of Wolbachia in shaping the genetic diversity within the Cx. pipiens complex. We examined mosquitoes from Europe, Asia, Oceania, Africa and America belonging to the four members of the Cx. pipiens complex: Cx. p. pipiens form pipiens, Cx. p. pipiens form molestus, Cx. p. pallens as well as Cx. quinquefasciatus, hereinafter respectively referred to as pipiens, molestus, pallens and quinquefasciatus (Additional file 1: Table S1). The collection encompasses both natural populations (mostly sampled during the period 1990 to 2012) and isofemale laboratory lines (derived from field specimens collected from 1950 to 2011). Each laboratory line descended from a single female founder and was further considered as a single individual. All specimens were stored in liquid nitrogen or in 70-95% ethanol, at room temperature or in a freezer at −20°C until examined. The wPip infections were genotyped and assigned to one group (wPip-I to wPip-V) using a series of specific PCR-RFLP (restriction fragment length polymorphism) assays based on two ANK Wolbachia markers, ank2 and pk1 (Additional file 1: Table S2 and Figure S1). HinfI digestion of the ank2 PCR products allowed discrimination of five alleles (a to e): a (one RFLP fragment: 313 bp), b (217, 195, 98 bp), c (293, 217 bp), d (217, 195 bp) and e (415 bp). TaqI digestion of the pk1 PCR products allowed discrimination of four specific wPip alleles (alleles a and e have the same fragment size): a/e (903, 430 bp), b (669, 665 bp), c (851, 498 bp) and d (497, 251, 107 bp). The pk1 a and e alleles were next distinguished using a digestion of the pk1 PCR products with PstI: a (903, 303, 141 bp) and e (903, 430 bp). For a subsample of specimens, three additional Wolbachia markers were sequenced: the DNA mismatch repair protein gene MutL, the putative secreted protein gene GP15 (also called VrlC) and the regulatory protein gene RepA (Additional file 1: Table S2). Four (ank2, MutL, GP15 and RepA) of these five Wolbachia genes were present in one single copy in the wPip(Pel) genome while the fifth (pk1) is present in three identical copies (Additional file 1: Table S2; see  and , for details). A total of 5 Wolbachia genes, encompassing 7 distinct loci with a wide distribution along the wPip(Pel) chromosome, were thus examined. None of these genes was amplified from Wolbachia-free Cx. pipiens lines, which confirmed their Wolbachia origin. DNA was extracted from individual mosquitoes using a CetylTrimethylAmmonium Bromide (CTAB)  or phenol/chloroform protocols . All PCR amplification conditions were: 5 min at 94°C, followed by 30–40 cycles of 94°C for 30s, 50°C-58°C for 30s, and 72°C for 1 to 1.5 min depending on the fragment size (detailed on Additional file 1: Table S2). Digestion of PCR products were performed following manufacturer’s instructions. The QIAquick gel extraction kit (QIAGEN, Valencia, CA) was used to purify the PCR products for sequencing. Sequences were obtained directly from purified products on an ABI Prism 3130 sequencer using the BigDye Terminator Kit (Applied Biosystems). The Cx. pipiens mtDNA haplotypes were determined through the sequencing of an 852 bp fragment from the cytochrome b (cytb) gene (Additional file 1: Table S2). For a subsample of specimens, we also obtained partial sequences of two additional mtDNA markers: the NADH dehydrogenase subunit 2 (ND2, 1160 bp) and 5 (ND5, 1132 bp) (Additional file 1: Table S2). The four Cx. pipiens taxa were identified using nuclear DNA of specimens. We included in this study some populations available from previous studies for which Cx. pipiens taxa were determined using 7 to 12 microsatellite loci and/or sequence variation in an intron of the acetylcholinesterase-2 (ace-2) gene (Additional file 1: Table S1). The taxa of new Cx. pipiens populations were identified using a combination of the PCR-RFLP on ace-2[29, 30] and a multiplex-PCR assay based on the flanking region of a microsatellite locus (CQ11; see  for more details) (Additional file 1: Table S1 and Table S2). Specimens from these new populations were considered as hybrids when they showed a heterozygous genotype at ace-2 or CQ11 loci. Sequence alignments were carried out using ClustalW  and corrected using MEGA . The GBLOCKS program  with default parameters was used to remove poorly aligned positions and to obtain unambiguous sequence alignments. The evolutionary model most closely fitting the sequence data was determined using Akaike information criterion with the MEGA program . Phylogenetic analyses were conducted using maximum likelihood (ML) and maximum-parsimony (MP) in MEGA . ML phylogenies were constructed based upon unambiguously aligned sites using the Tajima-Nei model of nucleotide substitution, assuming that nucleotide frequencies deviate substantially from 0.25 . MP phylogenies were constructed using the close-neighbour-interchange method . Bootstrap probabilities were calculated by generating 500 bootstrap replicates. New sequence data were deposited in GenBank (accession numbers KC686688- KC686692). The microsatellite data was first examined for compliance with Hardy–Weinberg equilibrium, and then pair-wise FST values and their significance were obtained using GENEPOP v4.2 . We assigned specimens to genetic clusters with a maximum likelihood algorithm implemented in the program Structure 2.3.4 . This method combines all the individual multilocus genotypes and separates them into K distinct clusters. We used the admixture model taking into account correlated allele frequencies between populations with 10,000 burn-in steps and 100,000 runs as MCMC (Markov chain Monte Carlo) parameters to assign specimens to genetic clusters. The degree of admixture, alpha, was inferred from the data (if alpha approaches zero most individuals are not admixed). With this parameter set, the geographic origin of each specimen is not considered but the number of clusters (from K = 1 to K = 7) is decided a priori for each run. To assess the consistency of the analysis we performed an exhaustive comparison of 10 runs for each K to assess the robustness of the results. We also performed the method described in Evanno et al. to confirm that the true number of clusters explaining our data was detected. The significance of non-random associations between wPip/mtDNA, wPip/Culex pipiens taxa or mtDNA/Culex pipiens taxa was estimated using an exact test procedure (Fisher exact test) implemented in GENEPOP . We assayed for the presence and the diversity of Wolbachia in 1935 specimens from 118 natural populations and 64 isofemale laboratory lines (Additional file 1: Table S1). Specific ank2 and pk1 PCR assays indicated the occurrence of infection by Wolbachia in all the examined specimens, showing that infection is fixed in all Cx. quinquefasciatus, Cx. p. pipiens form pipiens, Cx. p. pipiens form molestus and Cx. p. pallens populations examined here. We further used the ank2 and pk1 allelic profiles to assign a wPip group to each specimen (Table 1). We found in our collection the five known ank2 alleles and the five known pk1 alleles. Tests for intergenic recombination revealed significant linkage disequilibrium (LD) for ank2 and pk1 (Fisher exact test, P < 10-5): alleles at these loci are not randomly associated showing that they are stably co-transmitted within the wPip chromosome. Hence, the ank2 and pk1 allelic profiles are congruent and allowed unambiguously attributing the wPip group to 1836 (94.9%) of 1935 specimens (Table 1). For the 99 (5.1%) remaining specimens, ank2 and pk1 allelic profiles were not congruent with known haplotypes (Table 1), suggesting that these two loci had undergone recombination. To assign these 99 specimens to a wPip group, three additional Wolbachia markers were then sequenced: MutL, GP15 and RepA. Three to thirteen alleles were detected for each marker and led to the identification of 30 new wPip haplotypes from the 99 unassigned specimens (Table 1). Some of these alleles are null alleles: some specimens did not amplify at one of the loci (because of either mutation in the primer sites or gene deletion) showing that their wPip infections were genetically distinct from other known haplotypes. Positive amplifications of other loci (pk1, ank2) from samples with null alleles at either MutL, GP15 or RepA loci indicate satisfactory DNA template quality in these cases. Phylogenetic tree using ank2, pk1, MutL, GP15 and RepA concatenated sequences (5624 bp) showed that almost all new wPip haplotypes fall into one of the five wPip groups (Figure 1). Overall, the use of the three additional Wolbachia markers allowed the assignment to a wPip group to 96 of the 99 remaining specimens, with only two haplotypes (#29 found in two specimens and #30 in one specimen) remaining not assigned. New wPip haplotypes are identified by #number. Allelic profiles for GP15, MutL and RepA loci were determined for all new wPip haplotypes and for a subsample of specimens for the known wPip haplotypes. ND, allele not determined (DNA shortage); Dash, null allele (no PCR product); Asterisk, new allele. w Pip haplotypes phylogeny constructed using Maximum Parsimony method based on concatenated sequences of ank2 , pk1 , MutL , GP15 and RepA genes. Known wPip strains haplotypes are marked by full circles. Arrows show the two non-assigned haplotypes. Numbers on branches indicate percentage bootstrap support (500 replicates). Only bootstrap values > 70 were shown. The scale bar indicates the number of substitutions. Numbers in brackets correspond to locality numbers in Additional file 1: Table S1. Taking into account PCR-RFLP and phylogenetic grouping, we thus found that 823 specimens (42.5%) were infected by the wPip-I group, 326 (16.9%) by wPip-II, 414 (21.4%) by wPip-III, 261 (13.5%) by wPip-IV, 108 (5.6%) by wPip-V and 3 (0.1%) by undetermined wPip groups (Table 1). We found no evidence of specimens infected by more than one wPip group: only one allele per gene was observed for each DNA sample. The subsequent sequencing of ank2 and pk1 PCR products obtained from a subsample of specimens confirmed the observed RFLP profiles, with no double peaks (indicative of multi-infection) in electropherograms. The diversity of wPip showed an important spatial variation over the distribution area of the Cx. pipiens complex (Figures 2A, 2B, Additional file 1: Table S1). Two wPip groups were found to dominate wide geographic regions: only wPip-I was found in Sub-Saharan Africa, South America and Southeast Asia, and only wPip-III was observed in North America. The three other groups, wPip-II, wPip-IV and wPip-V, were less common. While wPip-II and wPip-V were confined to Western Europe and Asia, respectively, with very few exceptions, wPip-IV was more disseminated and was sporadically found in Europe, North Africa and Asia. Generally, only one wPip group was found per geographic region indicating a regional homogeneity of Wolbachia infections (Figure 2A), but a contrasting picture emerged in Europe where all five wPip groups were found (Figure 2B). Given that Europe is oversampled (709 individuals from 66 populations; Additional file 1: Table S1) relative to other parts of the world, the wPip diversity observed there could be simply a function of a higher degree of sampling effort. However, some regions have been also extensively sampled and still revealed fewer wPip groups (i.e. Africa: 569 individuals from 51 populations but only two wPip groups). Thus, oversampling does not seem to be a likely explanation for the great wPip diversity found in Europe. Geographic distribution of w Pip groups in the World (A) and in Europe (B). Numbers in the maps correspond to locality numbers in Additional file 1: Table S1. Bars and dots represent natural populations and laboratory strains, respectively. The bars show the prevalence of wPip group: blue, wPip-I infection; green, wPip-II; yellow, wPip-III; pink, wPip-IV; orange, wPip-V; black, undetermined group. On Figure 2A, Culex pipiens pipiens form pipiens and Culex pipiens pipiens form molestus = light blue; Cx. p. pallens = light green and Cx. quinquefasciatus = light pink (modified after Farajollahi et al. 2011). On Figure 2B, both Cx. p. pipiens form pipiens and Cx. p. pipiens form molestus are widespread in Europe. Details on sample size, prevalence and Cx. pipiens complex taxa are given in Additional file 1: Table S1. In most cases, only one wPip group was detected per population: 88 (74.6%) of the 118 natural populations harboured only one wPip group while, in the remaining 30 (25.4%), two to three wPip groups per population were observed. Twenty-two of the 30 populations were located in Europe and half (18 of 30) harboured Cx. pipiens individuals infected either by wPip-II or wPip-III. Aside from the wPip-II/wPip-III mixed populations found in Western Europe, at least five other geographic contact zones between wPip groups exist: in the North (wPip-II/wPip-IV) and in the South of Italy (wPip-I/wPip-IV), in North Africa (wPip-I/wPip-IV), in South America (wPip-I/wPip-III) and Eastern Asia (wPip-I/wPip-V) (Figures 2A, 2B). To investigate the association between wPip groups and mtDNA variation, we sequenced the cytb gene (that have been shown polymorphic in the Cx. pipiens complex, see ) in a subsample of 184 specimens from 101 Cx. pipiens natural populations and 44 isofemale laboratory lines. The cytb gene displayed low variability and eleven haplotypes with only ten variable nucleotide positions throughout the 852 bp cytb fragment (ca. 99.5% of pairwise identity) were obtained (Additional file 1: Table S3). Pairwise tests revealed significant LD for wPip groups and cytb haplotypes (P = 10-5) with a clear pattern of cytb haplotype specificity to wPip groups (Table 2). According to this association and following previous study , cytb haplotypes were partitioned in five mtDNA groups (mtDNA-1 to 5 associated to wPip-I to V groups, respectively; Table 2). When analysing the congruence between the five mtDNA and wPip groups, very little incongruence were observed. For instance, although the mtDNA-1 group contains 65 wPip-I-infected specimens, seven specimens infected with wPip-V were also found in this group (Table 2). A very similar pattern was found for five other specimens: one wPip-I-infected specimen was found in the mtDNA-4 group (otherwise associated to 20 wPip-IV-infected specimens), one wPip-II-infected specimen in the mtDNA-3 group (associated to 44 wPip-III-infected specimens), and 3 wPip-III-infected specimens in the mtDNA-2 group (associated to 39 wPip-II-infected specimens). To improve our understanding of this incongruence, two additional mtDNA genes (ND2 and ND5) were sequenced and phylogenetic analyses were conducted using cytb, ND2 and ND5 concatenated genes (2549 bp; Additional file 1: Figure S2). Only the seven wPip-V-infected specimens found associated with the mtDNA-1 group on the basis of cytb sequence were analysed since not enough DNA was available from the five remaining specimens. These analyses also included the two unassigned wPip haplotypes (#29 and #30) described above. The resulting phylogenetic tree does not group the seven incongruent specimens infected by wPip-V within the extended mtDNA-1 group, and they can not be assigned to a specific mtDNA group. These results suggest that the primary wPip-mtDNA incongruence observed in these specimens is likely due to low polymorphism in the mitochondrial gene studied here (see Additional file 1: Table S3). The two unassigned wPip haplotypes, #29 and #30, were clearly associated with mtDNA-3 and mtDNA-2, respectively. The strong association between mtDNA and wPip infection presented above indicates that these two haplotypes could be assigned with a low risk of error to wPip-II and wPip-III groups. To investigate the association of wPip groups with taxa within the Cx. pipiens complex, we examined the partitioning of wPip groups among 409 Cx. pipiens specimens assigned to one of four Cx. pipiens complex taxa: quinquefasciatus (n = 201, 49.1%), pipiens (n = 118, 28.8%), molestus (n = 64, 15.7%), and pallens (n = 20, 4.9%) as well as a few hybrids (n = 6, 1.5%) (Additional file 1: Table S1). The observed geographic distribution of our specimens was very similar to the known distribution of the Cx. pipiens taxa [17, 30] with quinquefasciatus widely present in tropical areas, pipiens and molestus in Europe, North Africa, Middle East and North America, and pallens confined to East Asia (Figures 2A, 2B). The association between Cx. pipiens taxa and wPip groups was highly significant (Fisher exact test, P < 10-4), as shown with quinquefasciatus that appeared mainly infected with the wPip-I group (133 of 201 individuals), pipiens with wPip-II (55 of 118) and pallens with wPip-V (19 of 20) (Table 3). However, the pattern is less clear for molestus that showed a more balanced prevalence of wPip groups with wPip-I, wPip-II and wPip-III more or less equally prevalent in molestus (each infecting 15 to 20 of 64 individuals). Overall, the association wPip/Culex pipiens taxa is thus far from exclusive since no wPip group was unique to a particular Cx. pipiens member: each Cx. 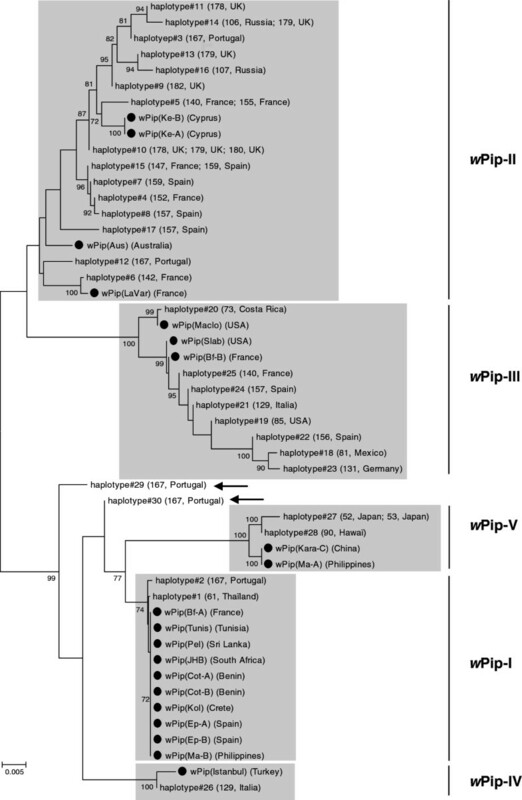 pipiens taxa harbours two to five different wPip groups. For instance, pipiens harbours infections of all five wPip groups and quinquefasciatus of three wPip groups (wPip-I, wPip-III and wPip-V). Alternatively, the heterogeneity of wPip infections among Cx. pipiens members could be based on potential artefacts from molecular typing: for some samples, taxa identification was done through the characterization of two nuclear markers, ace-2 and CQ11, an approach that could fail to detect hybrid individuals. To address this potential bias we refined our analysis by restricting our analyses to a subsample of 113 specimens from 12 populations (encompassing populations of quinquefasciatus: populations 12, 63, 76, 78, 84 and 90 in Table S1, pipiens: 130 and 181, molestus: 114 and 131, pallens: 52 and 53) that were typed with microsatellite loci. Although these mosquito populations were originally typed using 7–12 microsatellite loci, the loci used were however different depending on what Cx. pipiens taxa and studies they were for. Further analyses were thus conducted using four microsatellite loci (GT4, CxpGT12, GT46 and CQ26; [40, 41]) for which genotypes were available for all specimens. None of these loci had significant heterozygote deficits/excess in the examined populations, fitting with Hardy–Weinberg assumptions. A pair-wise FST comparison revealed significant differentiation between mosquito populations belonging to different taxa in all cases (FST values ranged from 0.165 to 0.660; Additional file 1: Table S4), while within taxa the FST values ranged from only 0.012 to 0.251 and were in some cases not different from zero (Additional file 1: Table S4), indicating that gene flow is more important within than between Cx. pipiens taxa. The result of the mosquito genetic structure analysis further separates the individuals into five distinct clusters analogous to the Culex taxa assignation (Figure 3). Indeed, the clustering separate pallens, pipiens, molestus, quinquefasciatus from America and quinquefasciatus from Africa and Asia. This clustering indicates a low hybrid rate (alpha ≈ 0.03) indicating that most individuals are not admixed and come from a cluster (Figure 3). The assignment of individuals using microsatellite data was in agreement with our primary assignment, although it separates quinquefasciatus populations in two distinct clusters depending on their geographic origins. Same as above, the association between wPip groups and Cx. pipiens members was still significant (Fisher exact test, P < 10-4) and also confirmed that this association is not exclusive since at least four wPip groups are shared by different Cx. pipiens members (Figure 3). The presence of shared wPip groups between Cx. pipiens members thus suggests that wPip infections undergo repeated transfers between quinquefasciatus, pipiens, molestus and pallens. Comparison of w Pip groups (A) with Cx. pipiens genetic clusters revealed by Bayesian analysis using microsatellites loci (B). Each of the 113 individuals included in the analysis is represented by a vertical line, partitioned into five squares assigned different colours (blue, wPip-I infection; green, wPip-II; yellow, wPip-III; pink, wPip-IV; orange, wPip-V) (A) and segments of different colours that represent the individual’s probability of belonging to one of the four genetic clusters (black, pallens; medium and dark grey, quinquefasciatus; soft grey, molestus; white, pipiens) (B). Specimens were grouped by location (bracketed), and the indicated population numbers are the same as in Additional file 1: Table S1. Finally, the association between mtDNA and Cx. pipiens members was assayed in 166 individuals (Table 4). As observed with wPip groups, there was a significant association between mtDNA and Cx. pipiens members (Fisher exact test, P < 10-4), but not exclusive: although mtDNA-1 group was common in quinquefasciatus (59 of 72 individuals) and mtDNA-2 group was common in pipiens (35 of 67), no mtDNA group was specific to a particular Cx. pipiens member (Table 4). As could be expected due to LD between wPip and mtDNA, the mtDNA distribution thus mirrored the wPip distribution across the Cx. pipiens complex, showing that they form together a single cytoplasmic unit. Overall, these results show that wPip and mtDNA share a joint evolutionary history, subtly different to the one of nuclear DNA and thus to the evolutionary histories of Cx. pipiens members. We sampled four evolutionarily closely related mosquito taxa within the Cx. pipiens complex for Wolbachia infection study. We further specifically tested for host-specific associations by characterizing Wolbachia and mtDNA haplotypes using multilocus typing schemes. The observed prevalence of wPip infection was 100% in all Cx. quinquefasciatus, Cx. p. pipiens form pipiens, Cx. p. pipiens form molestus and Cx. p. pallens populations, as usually recorded for these Cx. pipiens taxa [8, 25, 42]. The genotyping of wPip strains using the two ANK genes ank2 and pk1confirmed the presence of five distinct wPip groups as observed in a previous study  showing that ank2 and pk1 genes are suitable to assign wPip groups. However, by using additional wPip markers we detected greater diversity including new and recombinant haplotypes indicating higher wPip diversity than previously thought. Overall, our survey of infection diversity is therefore likely to seriously underestimate the true figure of wPip diversity that shows a rapid diversification in their natural host Cx. pipiens. The distribution of wPip groups appeared spatially structured, well exemplified by European Cx. pipiens populations that harbour the highest wPip diversity across all examined geographic regions. 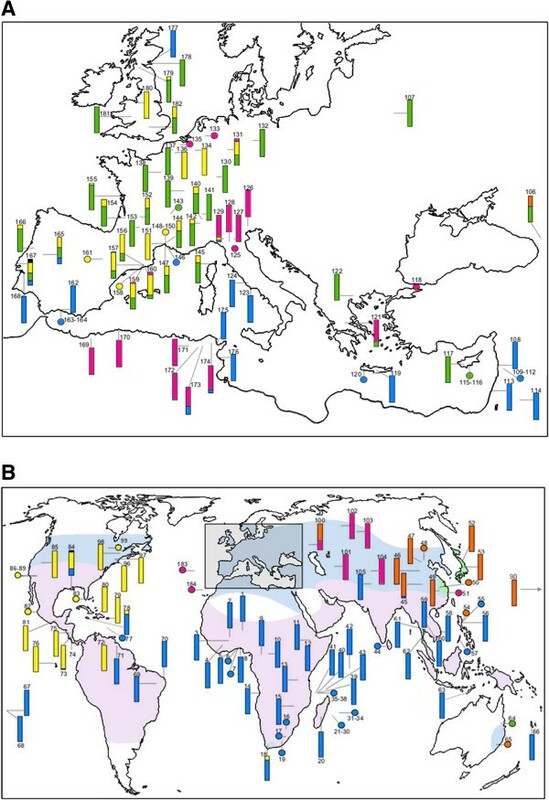 This suggests that the wPip ancestor may have initially spread in European populations where it evolved in five divergent groups, and that newly emerged wPip groups have only secondarily expanded outside Europe. Human migrations have also probably enhanced this process by expanding the geographic range of diverse Cx. pipiens members. For instance, both Cx. pipiens and Cx. quinquefasciatus were recently introduced into the Americas and Australia [16, 17, 19]. In the Americas, the presence of two wPip groups indicates that at least two separate introductions have occurred: one probably from Europe introduced wPip-III-infected Cx. pipiens to North America, the other from tropical Africa or South Asia introduced wPip-I-infected Cx. quinquefasciatus to Americas. In Australia, independent introduction events may also explain the presence of wPip-II and wPip-V, otherwise mainly found in Western Europe and Asia. That American and Australian populations came from multiple and independent colonization events from Europe, Africa and Asia is also well supported by the examination of Cx. pipiens microsatellites [18, 19]. Overall, the wPip distribution is likely to result from ancient and recent imprints, underlining the importance of historical contingencies in the population structure of infections. Remarkably, the mtDNA variation in the Cx. pipiens complex mirrored precisely the wPip variation, showing a great evidence for indirect selection arising from linkage disequilibrium with infections. mtDNA diversity was extremely reduced over the distribution area of Cx. pipiens members, which is likely to be a consequence of cytoplasmic hitchhiking driven by the recent invasion of the wPip ancestor, as pointed by previous studies [10, 14, 24]. The mtDNA of Cx. pipiens individuals infected by different wPip groups have further evolved to be distinct, showing that these two cytoplasmic elements have experienced a recent joint evolutionary history. As a result, wPip confounds the inference of Cx. pipiens evolutionary history from mtDNA data, as often observed in other Wolbachia-infected species [43, 44]. Because of vertical transmission, one should expect that persistence of wPip infection in the Cx. pipiens complex over long periods of time should result in diversification of Wolbachia alongside the host (co-cladogenesis). However, we did not observe this pattern: similar wPip groups and mtDNA haplotypes are found in different taxa and no cytoplasm type is specific to a given Cx. pipiens taxa. We rather showed that the cytoplasmic diversity tends to be homogenized across the four members of the Cx. pipiens complex we examined. Collectively, the data suggest a recent, and possibly still ongoing, cytoplasmic exchange between Cx. pipiens taxa. Two non-exclusive processes can explain why different Cx. pipiens taxa share similar cytoplasms. The first process is the relatively recent emergence of some Cx. pipiens taxa. The pipiens and molestus forms are very closely related and several scenarios place their divergence at 10,000 years ago , which is slightly more recent than the supposed emergence of wPip groups (estimated at ca 20,000 years ago; ). Assuming that wPip infections were initially present in the pipiens-molestus ancestor could explain why many shared wPip groups were found in both Cx. pipiens taxa. The second process that could lead the homogenization of cytoplasmic diversity is linked to hybridization events within the complex. Although each member of the Cx. pipiens complex has an unique genetic signature, their genetic independence is not absolute since occasional inter-taxa hybridization may occur [16, 18, 22, this study]. Hybridization may transfer wPip infections and associated mtDNA from taxa to taxa (i.e. cytoplasmic introgression) . This pattern fits well with the case of Cx. quinquefasciatus. This taxon has emerged long before the pipiens-molestus divergence , and before the initial wPip infection in European populations. It is thus likely that wPip has secondarily spread from Cx. pipiens to Cx. quinquefasciatus following cytoplasmic introgression since recurring hybridization occurs where their distribution overlaps [16–18]. A similar process could also explain the presence of two different wPip groups in Cx. p. pallens: this latter taxa is thought to be the result of unidirectional hybridization between Cx. p. pipiens females and Cx. quinquefasciatus males , a pattern that explains why Cx. p. pipiens and Cx. p. pallens share two wPip groups. Cytoplasmic introgression is likely still underway in the Cx. pipiens complex: hybrids between pipiens and molestus forms have been documented in North America and in southern Europe [18, 22] as well as between Cx. quinquefasciatus and Cx. p. pallens in Asia , and wPip infections may commonly flow from either side into the hybrid zone. It is now clear that Wolbachia impacts the Cx. pipiens diversity in different ways. The wPip distribution presented here showed a well-structured picture, and underlines a critical example of cytoplasmic introgression through sibling taxa. This situation is actually similar to adaptive introgression of beneficial alleles. Previous studies examining loci involved in insecticide resistance concluded that resistant alleles are undergoing frequent expansion across the complex through hybridization between Cx. pipiens members [46, 47]. Survey of Cx. pipiens neutral loci, however, show that recombination may break the connection between selected and neutral loci very quickly, maintaining the genetic differentiation between taxa and allowing the inter-taxa expansion of selected genes . Hybridization can weakly impact the global flow of nuclear genes but serves as a powerful mechanism of rapid adaptation for insect populations through the penetration of useful adaptive alleles. The wPip infections seem to operate in a similar manner as insecticide resistance genes in the Cx. pipiens members, suggesting that introgression has a crucial role in the dispersal of wPip infections. Of note, however, in the case of Wolbachia, infection spread may have a negative impact on population dynamics of mosquito hosts since it could drive deleterious mitotypes to fixation through cytoplasmic hitchhiking. It remains to be seen what role, if any, CI between incompatible wPip strains play in divergence between different geographic populations within the Cx. pipiens complex. We are very grateful to N. Pasteur, F. Zélé, F. Tredez, J. Tonnabelle, S. Boukraa, C. Malcolm, M. Raymond, F. Rousset, N. Perrin, R. Dabire, G. Duvallet, P. Tortosa, P. Carnevale, P. Guillet, C. Ngoagouni, I. Dufour, J. Vontas, A. Tsagkarakou, D. Ayala, M Calviti, M. Toure, F. Cui, S. Marcombe and G. Müller for collection help. We are also grateful to N. Pasteur and P. Labbé, for their helpful comments and suggestions, and to A. Berthomieu for technical help. All sequence data were obtained on the Environmental Genomic Platform of the IFR Montpellier-Environnement-Biodiversité. Contribution 2013-x of the Institut des Sciences de l'Evolution de Montpellier (UMR 5554 CNRS – Université Montpellier 2). Conceived and designed the experiments: ED, CMA, MW and OD. Performed the experiments: ED, CMA, OD, P Makoundou, SU, DMF, EVS. Analyzed the data: ED, P Milesi and OD. Wrote the paper: ED, MW and OD. All authors read and approved the final manuscript.